The responsive design format of Warship Technology eNews allows for easy viewing on any device, automatically adapting to the size of the screen on which it’s being displayed, presenting your message in an engaging, readable manner. 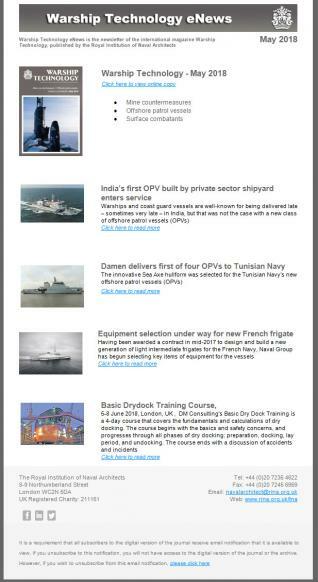 Warship Technology eNews will provide a vital news portal for key personnel in your target market. in conjunction with the printed issue of Warship Technology. You can gain maximum exposure by taking a prominent banner or button in the newsletter or become the exclusive sponsor of Warship Technology eNews, Published to over 11,000 industry professionals in over 100 countries, it provides a highly targeted message with no wastage. It can be tracked so you know who has seen it and who has opened it, meaning you know who has looked at your company’s products and/or services. Published directly to the ship repair and maintenance sector, there is no wasted readership, giving you a better return on your investment.